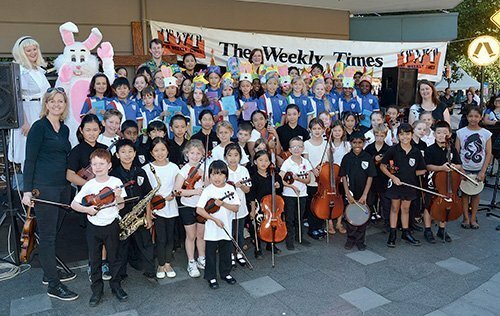 Combined local public school choir and orchestra from West Ryde and Meadowbank entertained at Saturday’s West Ryde Easter Parade and Fair to the delight of the many people present. TWT on-the-spot PHOTO. 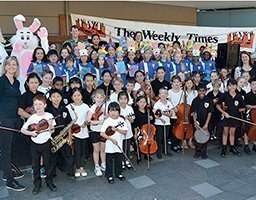 Congatulations to our winners in The Weekly Times Poster Colour-in Competition for the West Ryde Easter Parade & Fair which was most successfully held last Saturday. Winners were Stephanie Brown, Anthony Saba and Breanna Ng of St Anthony’s Catholic Primary School who was not present. 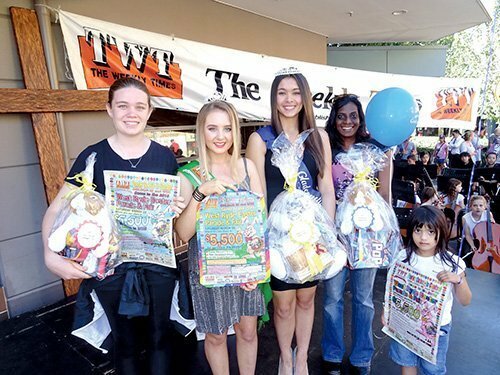 Winners are pictured with TWT Teen Queen Samantha Bowyer-Tagg and TWT Granny Smith Festival Queen Isabella Laguzza who were the competition judges. 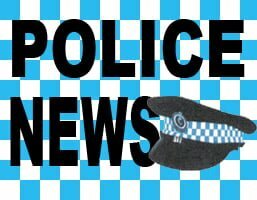 MORE FESTIVAL DETAILS AND PHOTO SEE PAGE 10. MORE PHOTOS NEXT WEEK. TWT on-the-spot PHOTO.